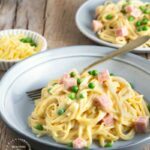 A weeknight dinner where the sauce is ready before the spaghetti is … spaghetti is cooked until al dente and then coated in a luscious creamy cheese sauce with diced ham and peas for an easy 15 minute dinner! My mom made ham tetrazzini all the time when we were growing up, only her version was made with cream of chicken soup. 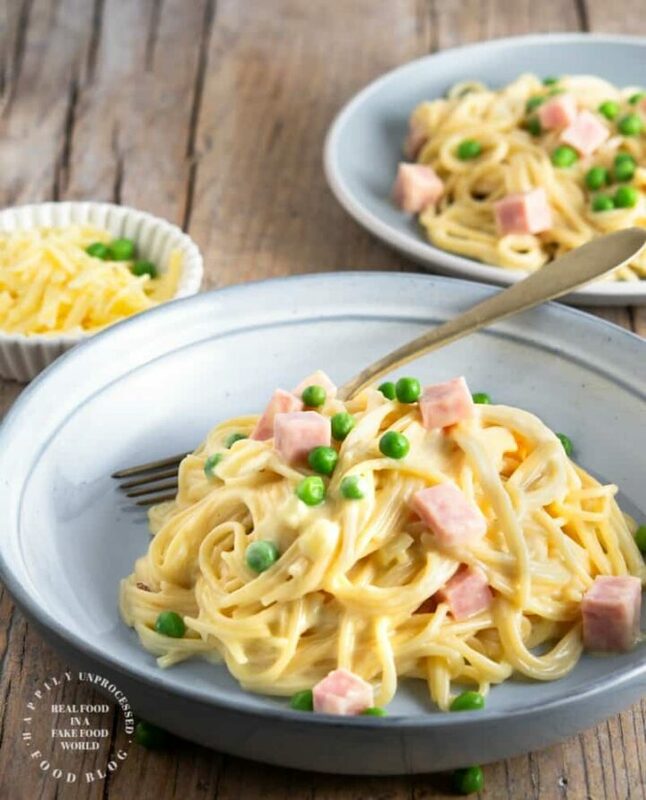 It was a really easy weeknight dinner and what kid doesn’t love spaghetti and cheese? All I remember is slurping up the spaghetti and instead of it having a tomato flavor it was creamy and cheesy. Then there was the added bonus of the saltiness of the ham and although I am not the biggest fan of peas, I somehow managed to get them down. 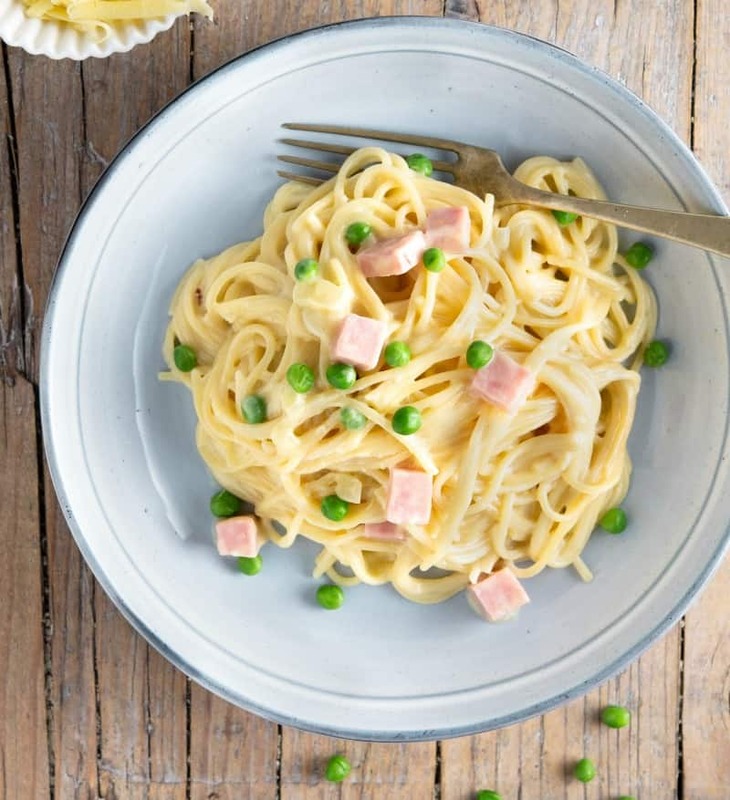 My kids also grew up eating Ham Tetrazzini and yes I used canned soup as my mom did. But today we are taking the same delicious comfort dish and making it without canned soups. I use cheddar cheese in this recipe, sometimes sharp cheddar. You can use white or yellow. I will tell you from years and years of experience that any other cheese will be too mild, you won’t really taste it. The dish will seem bland. Cheddar cheese has a bold flavor that clings well to the noodles without getting too runny or too thick. If you are looking to change things a little, you can add mushrooms or you can switch the cheddar for parmesan cheese and add minced garlic. That would give you more of a garlic parmesan noodle flavor if you like that. But personally I like this dish exactly the way it is. 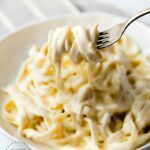 Creamy, cheesy, so filling and ready in 15 minutes! In a large skillet, over medium heat, add the olive oil and butter. Once the butter is melted add the onion and saute approximately 2-3 minutes or until it softens. Add the garlic and cook and stir for anoterh 30 seconds. Sprinkle the flour over the onions and garlic, stir. Slowly add the chicken broth and whisk. Add the half and half, then finally the cheese. Continue to stir as the cheese is melting. Add the ham and peas and spaghetti. 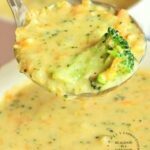 If the sauce is too thick, add a tablespoon of milk at a time to desired consistency. I can’t help but notice a lot of your recipes do you have processed foods in them. 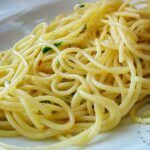 Pasta from a box is one of the most processed things you can eat. 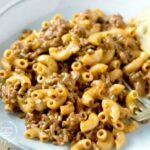 Our goal on this site is to ‘remake’ foods that our grandmothers made from scratch before they ended up in the middle of store shelves, such as hamburger helper, canned soups, jarred salsas etc. If you want to get really technical sour cream is processed as is milk. We can go on and on until we are literally making EVERYTHING we eat from scratch. This site is just to help get people back on track and out of the middle of the aisles. Thanks for your comment. I hope you find some recipes you like.